The field of dark matter (DM) particle physics is at an interesting stage, as key discoveries are anticipated. However, despite the intensive direct, indirect and LHC searches, the experiments have not yet yielded unambiguous Dark Matter (DM) signals. Though stringent constraints obtained on DM coupling to Standard Model (SM) particles ruled out many DM models, little is known about the origin and dynamics of DM itself. At the same time, the astrophysical evidence for dark matter remains as strong as ever. One reason behind the fact that DM remains a great puzzle is that it can be probed only through its gravitational interaction. Several theoretical ideas motivate the extension of the SM by introducing the concept of dark sectors that consist of a set of particles and fields, which are similar to that of the SM, but transform under the new gauge symmetries and do not interact with the SM. In analogy with QED, for which the massless photon mediates the force between the charged particles, there could be a dark QED with a dark photon (A´) that transmits the forces between dark particles. Such A´s could have a mass mA ´≲ 1 GeV, associated with spontaneously broken gauged U´(1) symmetry, and no direct coupling to visible matter. However, they could couple to the SM through the kinetic mixing with the ordinary photon. The idea that, in addition to gravity, a new force between the dark sector and visible matter transmitted by a new vector boson A ´ may exist and could be tested at low energies, in particular at the CERN SPS, is very exciting. If A´ is the lightest state in the dark sector, then it would decay mainly visibly, i.e. typically to SM leptons e, μ or hadrons, which could be used to detect it. However, in the presence of light dark states, in particular dark matter particles, with the masses < mA´ , A´ could predominantly decay invisibly into those particles. Models introducing such invisible A´ offer new intriguing possibilities to explain not only hints on astrophysical signals of dark matter, but also the 3.6 σ deviation from the SM prediction of the muon anomalous magnetic moment gμ − 2 by existence of a sub-GeV A ´with the coupling strength to ordinary photon ε ≃10−3. This has motivated worldwide theoretical efforts towards dark forces and other portals between the visible and dark sectors, which might be probed at low energy and in high-precision experiments. 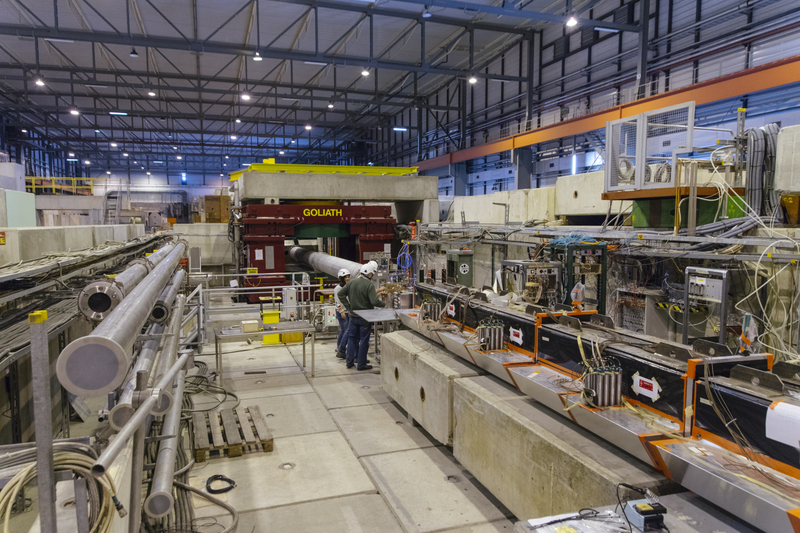 To be sure that such excess is caused by 100 GeV beam electrons , the synchrotron radiation emitted by them in a strong magnetic field is used to tag each electron individually and unambiguously. Besides the NA64 method, dark photons could be also detected with a classical beam dump experiment. In this case, the dark photon decay products, i.e. other dark sector particles, could penetrate the dump and have observable interactions in a far detector. The advantage of the NA64 approach is that, for some A´ parameter regions, much less electrons on target are required to observe the A´ than in the beam dump mode. This makes these two approaches complementary to each other. The technique based on observing missing energy in the products of high-energy interactions, currently being explored by NA64 on an electron beam, has been put forward at the Physics Beyond Colliders kick-off workshop in September 2016, where a broad physics programme of research with electron, muon, pion, kaon and proton beams has been proposed. NA64 began operation in July 2016 for a period of two weeks and the collaboration completed a second four-week run on 9th November. The July results were published in Phys. Rev. Lett. (2017). A few months later, the BaBar collaboration at SLAC reported on their search for evidence of the A´-> invisible decay. Both collaborations did not detect a dark photon signature in their data, allowing them to place 90% confidence-level upper limits on the coupling strength of Aʹ, in particular excluding values of the Aʹ coupling suggested for the dark-photon interpretation of the muon g-2 anomaly (see Figure 2). Figure 2. (Courtesy of CERN Courier, April 2017). While not ruling out the existence of dark photons, these results serve as important constraints and give guidance for the development of further models, which might extend the SM. NA64 will continue to search for A´s and other dark-sector particles that have invisible decay modes. Significantly more data accumulated in 2017 will allow narrowing the search further. The search for dark photons is one of many approaches for the detection of dark matter. Today, we have a wide and rapidly growing variety of models motivating new particles weakly coupled to lepton and/or quarks solving DM and other problems in particle physics. To strengthen experiments operating in such an unusual situation, NA64 was conceived as a new type of experiment, able to provide a quick response in testing these models. In this sense, the NA64 type might be specifically referred to as scientific “rapid deployment forces”. For example, recently, the experiment of Krasznahorkay et al. in ATOMKI has reported observation of a 6.8 σ excess of events in the invariant mass distributions of e+e− pairs produced in the 8Be∗ exited state nuclear transitions to its ground state accompanied by an emission of an e+e− via internal pair creation. It has been shown that this anomaly can be interpreted as an emission of a new protophobic gauge boson followed by its prompt X → e+e− decay and provide a particle physics explanation of the anomaly, consistent with all existing constraints, assuming its coupling to electrons is in the range of 2×10 -4< ε < 1.4×10 -3 and mass mX = 16.7 MeV. The models predict relatively large charged lepton couplings εe ≃ 0.001 that can also resolve the muon g-2 anomaly. In October 2016 after a small detector reconfiguration, NA64 took a short run to test feasibility for the X → e+e− decays search at the H4 line. The obtained results were quite promising and the experiment received a recommendation from the SPSC to continue the search for the X → e+e− decays in 2017. This search could discover some new phenomenon that leads the field in new directions.